I’ll get straight to the point – I’m really impressed with this compact. 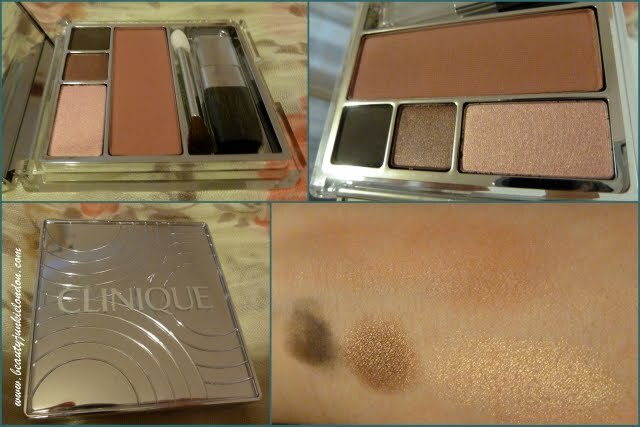 I love all the eyeshadow colours (especially the palest shade – it’s stunning) and the blush is gorgeously wearable. Maybe it’s just me who thinks this, but these colours are quite interesting for Clinique (the eye shadows – the blush colour is apparently from the main collection) they are a little less ‘neutral’ and a bit more fashion forward. I love the pinky-pearly palest shade and the warm, shimmering berry shade is gorgeous for adding a bit more depth. The picture above is a quick ‘eye of the day’ that I tried out on Sunday – using a big fluffy brush to apply the pale colour and smudging the two darker ones on with my fingers (I’m no professional…) I just used the Clinique eye colours and my current mascara of choice (Collection 2000 Big Fat False Lashes). I’m really love these shades! They are all well pigmented, smooth and easy to apply – although using a fat brush for the blusher was a little awkward (I’m never keen on the brushes that come with this sort of compact) but I managed! Great value for money – priced £25 from Boots.com what do you think of the colours? p.s. Now craving strawberry fudge…. Ooh I have this palette! Aren’t the colours lovely! They are a little more brown toned so it’s nice for autumn/winter. Ficou lindo no seu olho, amei as cores ficam bem el qualquer look.